Beautiful shot. People are always acceptable in landscapes. Many professional photographers advise including a person in a landscape to set perspective and scale. Thanks Cal, coming from you, that's an honor !! I like the slight motion blur from the casting of the rod. Quick question, do you ever have any wind over there? I don't think I have ever seen as many great pics with perfect mirror reflections as you have been posting! Can you sense the jealousy? if you look at the bottom two pics here, the wind was HOWLING, which has given the feeling in the third one much like an oil painting, paticularly the willows at the back, also you can see the grass in bothbeing blown sideways. I really like it. There seems to be some awesome spots in your area. 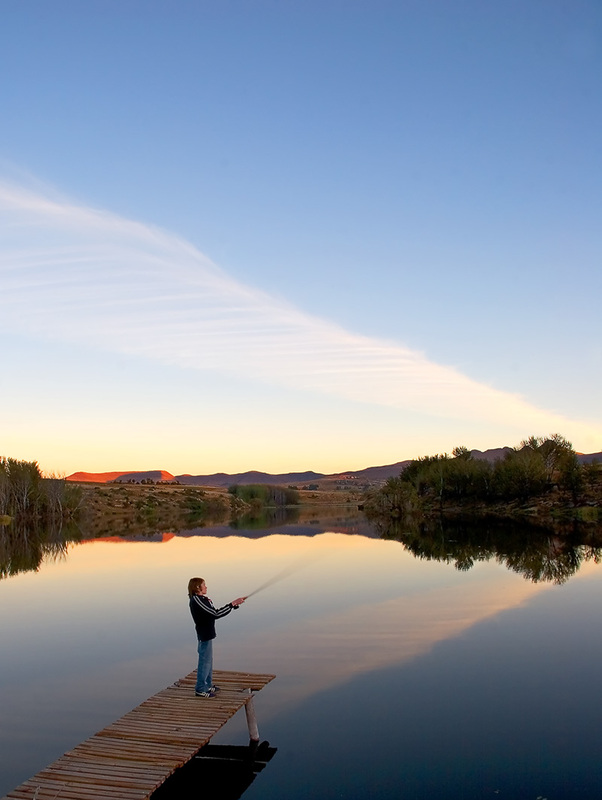 This photo makes me want to start fly fishing. Outstanding photo Jake. The way the reflection of the clouds leads right to the fisherman just gives it the right perspective drawing your eye in. Great stuff. cheers.....thekman. Thanks, Julie, thekman and John - I must admit to being an opportunist photographer and rarely "plan" a photo, maybe to my detriment, so what I do is try and have my camera handy as much as possible [and of course, the best opportunities come by when you don't have the camera on you !! ], and thenif I see a scene I like, I take as many shots as possible in differentanglesthat I feel would work, and sometimes end up with something that is "keepable". I have to admire the film photographers where instantreview is not available, developing is expensive, so they HAVE to get it right. Digital certainly has made it a lot easier to accomplish photography. - anyway, that's my few cents worth - try and try, and.....try some more. Very Good Jake. The inclusion of that young man enhances the photo.